Boffa Miskell were first approached by Comvita NZ Limited to assist with obtaining the necessary planning approvals needed to redevelop and expand its commercial and manufacturing headquarters at Paengaroa in the Bay of Plenty. Comvita is an international health and beauty products company that sells into more than 18 countries. Boffa Miskell developed a Structure Plan for the redevelopment of the site and this has been incorporated in the Western Bay of Plenty District Plan. Our Tauranga design team has been involved from the Structure Planning stage and have compiled a concept master plan for the entire site. 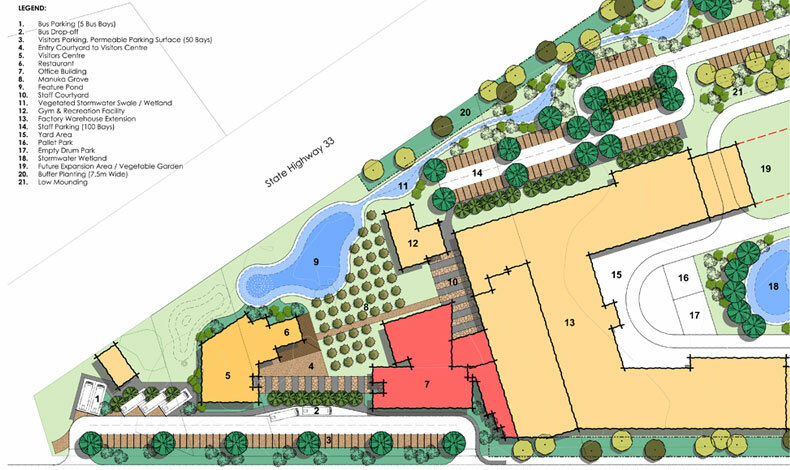 Stage 1 of the redevelopment entails the redevelopment of the existing visitors centre and incorporates public parking areas, staff parking, a public plaza space, stormwater management elements including a large rain garden, swale system, stormwater ponds and perimeter mounding required by the structure plan. For Stage 1, Boffa Miskell undertook detailed design and acted as the Engineer to the Contract, managing the implementation of the Stage 1 External Works. Tauranga ecologist Louise Saunders has been working closely with Comvita to develop an integrated wastewater management system, including floating treatment wetlands and disposal via on site irrigation. Planning, ecology, landscape planning, detailed design and project management.